Wetted Materials: Float and Rod: 316SS; Body: Brass or 316SS standard; Magnet Keeper: 430SS standard, 316SS or Nickel optional. Pressure Limit: Brass body 1000 psig (69 bar), 316SS body 2000 psig (138 bar). Standard float rated 100 psig (6.9 bar). For other floats see options on Options/Accessories page. Enclosure Rating: Weatherproof and explosion-proof. Listed with UL and CSA for Class I, Groups C and D; Class II, Groups E, F, and G. ATEX CE 0344 EX II 2 G EEx d IIB T6 -20°C=Tamb=75°C, EC-Type Certificate No: KEMA 03 ATEX 2383. SAA: Exd II C T6 (T amb=60°C). IP66 C1 I, Zone I. Also FM approved. Electrical Rating: UL, FM, ATEX and SAA models: 10A @ 125/250 VAC. CSA models: 5A @ 125/250 VAC; 5A res., 3A ind. @ 30 VDC. 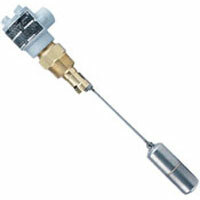 MV option: 1A @ 125 VAC; 1A res., .5A ind. @ 30 VDC. MT option: 5A @ 125/250 VAC. (MT and MV options not UL, CSA, FM, ATEX or SAA). Deadband: 3/4" (19 mm) for standard float. Specific Gravity: 0.7 minimum with standard float. For other floats see Options/Accessories page.